The estimation of pregnancy dates is important for the mother, who wants to know when to expect the birth of her baby, and for her health care providers, so they may choose the times at which to perform various screening tests and assessments,  such as serum screening, assessment of maturity, and induction of labor for postdate pregnancies. The 3 basic methods used to help estimate gestational age (GA) are menstrual history, clinical examination, and ultrasonography. The first 2 are subject to considerable error and should only be used when ultrasonography facilities are not available. The date of feeling the first fetal movements (quickening) is far too unreliable to be useful. The date of the first documented positive pregnancy test and the beta-human chorionic gonadotropin (bHCG) level may help ascertain the minimum gestational age. In women who conceived following assisted reproduction techniques, the date of embryo transfer is known and may date the pregnancy accurately. In rare cases, the date of coitus is known, and this may be useful in calculating the length of pregnancy. For related information, see Medscape's Pregnancy Resource Center. Gestational age (GA) refers to the length of pregnancy after the first day of the last menstrual period (LMP) and is usually expressed in weeks and days. This is also known as menstrual age. Conceptional age (CA) is the true fetal age and refers to the length of pregnancy from the time of conception. This terminology does vary geographically and over time, and it may need clarification if not explicitly defined in relevant articles. To further complicate matters, 10-45% of pregnant women cannot provide useful information about their LMP, and 18% of women with certain menstrual dates have significant differences between menstrual and ultrasonographic dating. The accuracy of menstrual history in women with a history of oligo-ovulation, such as those with polycystic ovarian syndrome, should be questioned. If conception occurred while oral contraceptives or long-acting progestogens were being taken, the LMP cannot be used because it has no relation to the time of ovulation. Knowing the date of the first positive pregnancy test result allows the calculation of a minimum GA. This depends on the sensitivity of the test. For example, if the test was performed 4 weeks ago and the test is known to return positive results as early as 1 week after conception, then the minimum conceptional age (CA) would be 5 weeks (GA, 5 + 2 = 7 wk of amenorrhea). This information can be useful in clinical practice if the test finding has been documented by a health care professional. Not infrequently, practitioners are called upon to manage pregnancies resulting from in vitro fertilization or intrauterine insemination. The GA of pregnancies resulting from in vitro fertilization can be precisely calculated from the time of embryo replacement; however, conception may be delayed for a few days in pregnancies resulting from intrauterine insemination. In patients who have had ovulation induction, calculate GA from the day of human chorionic gonadotropin administration. The size of the uterus can be assessed by pelvic examination or by abdominal palpation. Size can be misleading in the presence of multiple pregnancy, uterine fibroids, or a full bladder. Tape measurement of the symphysis-fundus height may be useful up to 28-30 weeks' gestation, beyond which it becomes too inaccurate for dating. The perception of fetal movement by the patient, often referred to as quickening, is a relatively late sign of pregnancy, usually occurring at 19-21 weeks' gestation in nulliparous women and 17-19 weeks' in multiparous women. Before the advent of pregnancy tests and ultrasonography, quickening was often the method by which a suspected pregnancy was confirmed; however, at present, it has little diagnostic value. The expected date of delivery (EDD) is one of the earliest pieces of information a pregnant woman requests once pregnancy is confirmed. In order to calculate the EDD, the practitioner must know the median length of normal pregnancy and the last menstrual period (LMP) or ultrasonographic estimation of gestational age (GA). Pregnant women should be counselled that only 4% of all babies are born precisely on the estimated date of confinement. Failure to appreciate this may lead to unnecessary maternal anxiety if a pregnancy progresses beyond the EDD. Therefore, giving a range for the likely date of birth (eg, EDD -2 weeks to EDD +1 week) is more useful. The median length of human pregnancy is 280 days of amenorrhea (from the first day of the LMP) or a CA of 266 days (280-14). Infants born before 37 completed weeks' gestation are deemed preterm, whereas those born after 42 weeks' are considered post-term. In normal pregnancies, the length of gestation is minimally affected by maternal characteristics. However, obese women are significantly more likely to go post-term. In women with regular cycles and a certain LMP, the EDD is calculated by adding 7 days to the first day of the LMP and adding 9 months. For example, with an LMP beginning on June 15, the EDD will be March 22 of the following year. Most antenatal clinics have obstetric wheels. These consist of an outer wheel that has markings for the calendar and an inner, sliding wheel with weeks and days of gestation. They facilitate the estimation of GA and the calculation of the EDD. The quality of these wheels varies, but in general, the larger wheels yield better results. More accurate results can be obtained by using computer software or web-based online calculators (eg, as found online at the Gestation Network). The introduction of obstetric ultrasonography in the early 1970s led to a marked improvement in the evaluation of fetal and placental anatomy, as well as fetal growth. Now, it is by far the most accurate technique for estimating gestational age (GA). Most pregnant women have a first trimester scan, followed by a detailed scan for anomalies in the second trimester. Other documented benefits of obstetric ultrasonography include the detection of multiple pregnancies and fetal abnormalities, and the identification of placenta previa. 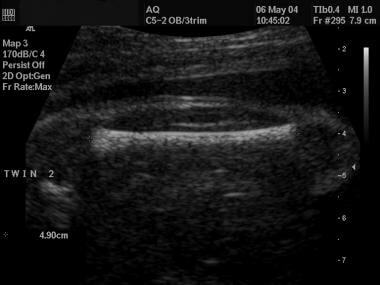 In the early first trimester, when no structures are visible within the gestational sac, GA may be estimated from the sac diameter. Several formulas can accomplish this. A common method is to measure the mean sac diameter (MSD), by calculating the mean of the 3 sac diameters. GA is then determined by consulting a table. An alternative simpler method is to add 30 to the sac size in millimeters, to give GA in days. By the time the embryo becomes visible on ultrasound the sac diameter is no longer accurate in estimating gestational age. If cardiac activity can be detected but the embryo is not measurable, the GA is about 5.5-6.0 weeks. GA in the first trimester is usually calculated from the fetal crown-rump length (CRL). This is the longest demonstrable length of the embryo or fetus, excluding the limbs and the yolk sac. 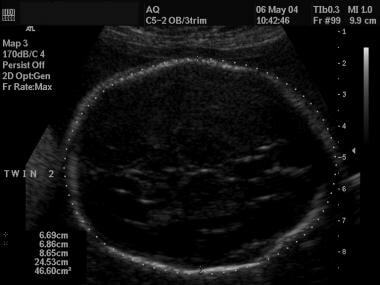 Ultrasonographic view of a fetus for a crown-rump measurement. The biparietal diameter measured between 9 and 13 weeks’ gestation has recently been shown to be at least as accurate as the CRL,  with smaller random errors. Fetal biometry in the second trimester can yield acceptably accurate estimates of GA from 12 to approximately 22 weeks of amenorrhea. Recent work has shown that the accuracy of ultrasonographic biometry at 12-14 weeks' gestation is at least as good as biometry performed after 14 weeks. [12, 13] The best parameters are the biparietal diameter (BPD) and the head circumference (HC), which are virtually linearly related to GA.
Ultrasonographic image of a fetal head, with measurement of the head circumference. Ultrasonographic view of a fetal femur. Combinations of multiple variables to date a pregnancy have also been described; however, the improvement in accuracy from these algorithms is clinically negligible. 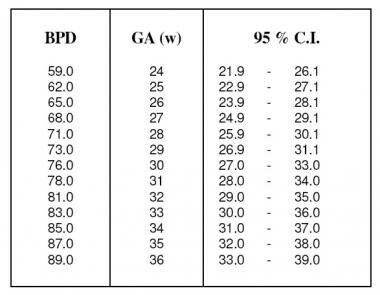 The table below illustrates the 95% confidence limits for GA estimated from the BPD in the third trimester. Estimate of gestational age (weeks) from the biparietal diameter in the third trimester with 95% confidence intervals. Adapted from Hadlock et al (1984). Confirmation of fetal maturity may also be obtained by examining the ossification centers. The distal femoral epiphysis appears at a mean age of 32-33 weeks' gestation, but may be seen as early as 29 weeks' gestation  ; its size increases linearly with gestational age. A distal femoral epiphysis diameter greater than 7 mm indicates a gestational age greater than 37 weeks. Visualization of the proximal tibial epiphysis indicates a gestational age of at least 35 weeks. The sonographic detection of the proximal humeral epiphysis has been correlated with a mature amniocentesis lung profile. In many ultrasound departments, a common practice is to combine the last menstrual period (LMP) with ultrasonographic dates in what is known as the 10-day rule or 7-day rule. For example, with the 10-day rule, if LMP dates and ultrasonographic dates are in agreement within 10 days, LMP dates are accepted. On the other hand, if the discrepancy exceeds 10 days, ultrasonographic dates are used. The rationale for using these rules is to exclude large errors from incorrect menstrual dates. The implicit assumption of this method is that menstrual dating is preferable to ultrasonographic dating. Detailed analysis from large databases has not shown any advantage in using these rules. 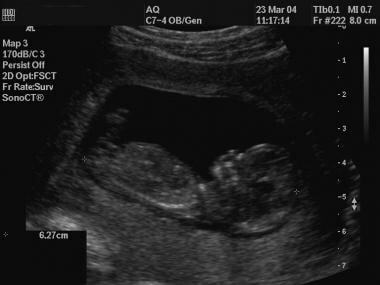 Unless the fetus is thought to be anatomically abnormal, ultrasonographic dates may be used for all pregnancies if a scan is available in the first half of pregnancy. However, combining menstrual dates with ultrasonographic dates is still widely practiced in the United States and in Australia. Computer software is now available for accurate determination of GA from either ultrasonographic biometry or menstrual dates, and results are more accurate than those obtained with obstetric wheels. Such software is accessible online through the Gestation Network and can be downloaded free of charge (see Gestation Network, Gestational Age Calculator). A discrepancy more than 7 days between menstrual and ultrasound dates is noted in 25% of women, and is more common in cases with a BMI >30, in whom the estimated due date is often postponed. In a large trial on ultrasonography, the risk of cesarean section increased from 10% when the ultrasonographic-based GA exceeded the LMP-based estimate by 4 days to 60% when the discrepancy increased to 21 days in nulliparous women. Also, for each day the ultrasonographic-based estimate exceeded the LMP-based estimate, birth weight was higher by 9.6 g.  A discrepancy of greater than +7 days can also arise from a prolonged interval between last menstruation and conception. These women, especially multiparae, are at an increased risk of preterm labor, with an OR of 1.9. A smaller than expected CRL in the first trimester may rarely be due to chromosomal anomalies. Peek MJ, Devonald KJ, Beilby R, Ellwood D. The value of routine early pregnancy ultrasound in the antenatal booking clinic. Aust N Z J Obstet Gynaecol. 1994 May. 34(2):140-3. [Medline]. Wilcox M, Gardosi J, Mongelli M, et al. Birth weight from pregnancies dated by ultrasonography in a multicultural British population. BMJ. 1993 Sep 4. 307(6904):588-91. [Medline]. Geirsson RT, Busby-Earle RM. Certain dates may not provide a reliable estimate of gestational age. Br J Obstet Gynaecol. 1991 Jan. 98(1):108-9. [Medline]. Guerrero R, Florez PE. The duration of pregnancy. Lancet. 1969 Aug 2. 2(7614):268-9. [Medline]. Nägele FC. Lehrbuch der Beburtshilfe fur Hebammen. 3rd ed. 1836. Westerway SC, Davison A, Cowell S. Ultrasonic fetal measurements: new Australian standards for the new millennium. Aust N Z J Obstet Gynaecol. 2000 Aug. 40(3):297-302. [Medline]. Lohr PA, Reeves MF, Creinin MD. A comparison of transabdominal and transvaginal ultrasonography for determination of gestational age and clinical outcomes in women undergoing early medical abortion. Contraception. 2010 Mar. 81(3):240-4. [Medline]. Chaudhuri K, Su LL, Wong PC, Chan YH, Choolani MA, Chia D, et al. Determination of gestational age in twin pregnancy - Which fetal crown-rump length should be used?. J Obstet Gynaecol Res. 2013 Apr. 39(4):761-5. [Medline]. Wu FS, Hwu YM, Lee RK, Li SH, Sun FJ, Lin MH, et al. First trimester ultrasound estimation of gestational age in pregnancies conceived after in vitro fertilization. Eur J Obstet Gynecol Reprod Biol. 2012 Feb. 160(2):151-5. [Medline]. Skupski DW, Owen J, Kim S, et al. The NICHD Fetal Growth Studies: Development of a contemporary formula for estimating gestational age from ultrasound fetal biometrics. AJOG. January 2016. 214 (1) Supplement:S74. [Full Text]. Goodier R. A Revised Formula Better Estimates Gestational Age From US Biometrics. Reuters Health Information. Available at http://www.medscape.com/viewarticle/858710. February 12, 2016; Accessed: June 15, 2016. Sladkevicius P, Saltvedt S, Almström H, Kublickas M, Grunewald C, Valentin L. Ultrasound dating at 12-14 weeks of gestation. A prospective cross-validation of established dating formulae in in-vitro fertilized pregnancies. Ultrasound Obstet Gynecol. 2005 Oct. 26(5):504-11. [Medline]. Saltvedt S, Almström H, Kublickas M, Reilly M, Valentin L, Grunewald C. Ultrasound dating at 12-14 or 15-20 weeks of gestation? A prospective cross-validation of established dating formulae in a population of in-vitro fertilized pregnancies randomized to early or late dating scan. Ultrasound Obstet Gynecol. 2004 Jul. 24(1):42-50. [Medline]. Mongelli M, Yuxin NG, Biswas A, Chew S. Accuracy of ultrasound dating formulae in the late second-trimester in pregnancies conceived with in-vitro fertilization. Acta Radiol. 2003 Jul. 44(4):452-5. [Medline]. Persson PH, Weldner BM. Reliability of ultrasound fetometry in estimating gestational age in the second trimester. Acta Obstet Gynecol Scand. 1986. 65(5):481-3. [Medline]. Hadlock FP, Deter RL, Harrist RB, Park SK. Estimating fetal age: computer-assisted analysis of multiple fetal growth parameters. Radiology. 1984 Aug. 152(2):497-501. [Medline]. Mongelli M, Chew S, Yuxin NG, Biswas A. Third-trimester ultrasound dating algorithms derived from pregnancies conceived with artificial reproductive techniques. Ultrasound Obstet Gynecol. 2005 Aug. 26(2):129-31. [Medline]. Mahony BS, Bowie JD, Killam AP, Kay HH, Cooper C. Epiphyseal ossification centers in the assessment of fetal maturity: sonographic correlation with the amniocentesis lung profile. Radiology. 1986 May. 159(2):521-4. [Medline]. Mahony BS, Callen PW, Filly RA. The distal femoral epiphyseal ossification center in the assessment of third-trimester menstrual age: sonographic identification and measurement. Radiology. 1985 Apr. 155(1):201-4. [Medline]. Mongelli M, Wilcox M, Gardosi J. Estimating the date of confinement: ultrasonographic biometry versus certain menstrual dates. Am J Obstet Gynecol. 1996 Jan. 174(1 Pt 1):278-81. [Medline]. [Guideline] National Institute for Health and Clinical Excellence (NICE). Antenatal care: routine care for the healthy pregnant woman. National Institute for Health and Clinical Excellence (NICE). Available at http://www.nice.org.uk/CG62. Accessed: March 22, 2012. Simic M, Wåhlin IA, Marsál K, Källén K. Maternal obesity is a potential source of error in mid-trimester ultrasound estimation of gestational age. Ultrasound Obstet Gynecol. 2010 Jan. 35(1):48-53. [Medline]. Grewal J, Zhang J, Mikolajczyk RT, Ford J. Risk of cesarean delivery when second-trimester ultrasound dating disagrees with definite last menstrual period. Am J Perinatol. 2010 Aug. 27(7):587-93. [Medline]. Gardosi J, Francis A. Early pregnancy predictors of preterm birth: the role of a prolonged menstruation-conception interval. BJOG. 2000 Feb. 107(2):228-37. [Medline]. The authors and editors of Medscape Reference gratefully acknowledge the contributions of previous author Michael Peek, PhD to the development and writing of this article.